The Minoan civilization - Is their empire of trade and art Atlantis ? Where is Atlantis ? Ever since Plato mentioned the existence of the fabled island-city in the 4th century BC, archaeologists, historians and adventurers have spent much time and ink trying to chase down its origins. One of the suggested locations of Atlantis is the island of Crete, just off the Greek coast. 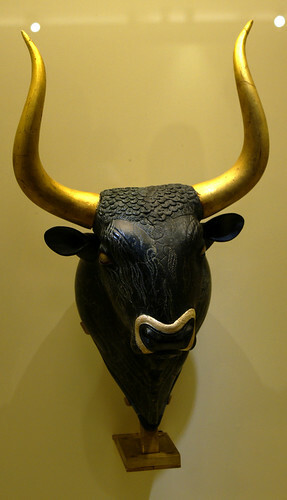 In around 2000 BC it was home to the Minoans. Sir Arthur Evans, one of the first people to excavate the civilization, named the Bronze Age civilization after King Minos, a mythical king who is said to have ruled from Crete in ancient times. Most of what we know about the Minoans comes from the architecture and artefacts they left behind. While they were a literate people, the script they produced, which archaeologists call Linear A, remains un-deciphered. The Minoans did not rise in isolation. In circa 2000 BC the Egyptians were re-unifying into their Middle Kingdom period. At the same time, in Mesopotamia, the Assyrians were growing into a massive state. If Atlantis was indeed the city of the Minoans, then Plato had a really inflated idea of their military prowess. There is little evidence that the Minoans controlled more territory than Crete and some nearby islands. They never conquered Egypt or controlled large sections of Europe, as the people of Atlantis are said to have done. Today we know that they were interested in military affairs. There are fortifications on Crete, including some just-discovered walls at Gournia.